Techno purists might have difficulties to accept this record. I was puzzled before and still am, to take a position whether it’s a terrific or terrible record. Because, in spite of some features of a heavily pumping floor burner, it bears a distinct softer side when trance fairies descend on the grooves. After a dark and energetic start, sweet melodic layers and guitars come up in “Virgo Widow” and remind of 1980’s charmer Nik Kamen. 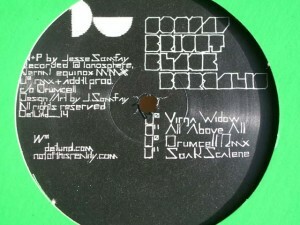 Drum staccatos and acid lines dominate in thumping “All Above All” while Drumcell’s rattling interpretation would satisfy the taste of techno heads bound for dark sweaty rooms. For the end, “Soak Scalene” moves in downtempo regions where a distant pied piper is heard walking down shadowy alleys. A gentle cut, reminding of the beautiful side of the electronic music. Canadian Jesse Somay was among main protagonists of minimal flood in mid-2000’s, doing several records on Archipel, but has been less in the limelight since that. Now he comes with an euphoric and daring release that might be quite a sensation at summer raves. Anticipating bluegrass versions, not joking.